Wow, great tool ReportSync! Thank you! Loading failed.This operation is not supported on a report server that is configured to run in SharePoint integrated mode. 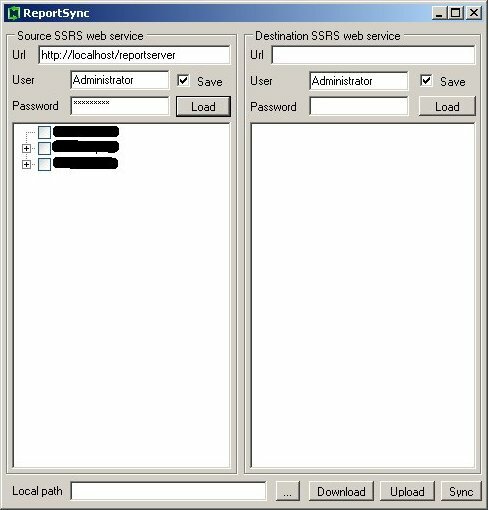 ---> Microsoft.ReportingServices.Diagnostics.Utilities.OperationNotSupportedSharePointModeException: This operation is not supported on a report server that is configured to run in SharePoint integrated mode. I have never tested it with a sharepoint server. From the error it seems the login is failing. Does sharepoint integrated mode use the current users credentials? In this case you can face kerberos hop issues. Cannot say for sure until I have access to a sharepoint server. Will try to get my hands on one and test it.